With distinctive powdery blue new foliage Lomandra glauca ‘Blue Ridge’ is beautiful landscaping variety. The foliage will darken to a green as it ages however after a year or two the constant mix of the blue against the deeper green makes this a standout variety. As this plant has a fairly upright growth habit it does look great when planted with a little space between the clumps. It is also suited for mass planting to cover a larger area if required. 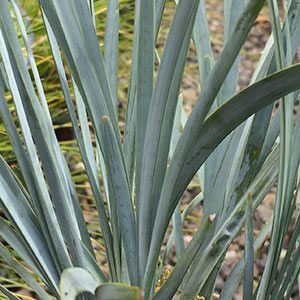 Plant Lomandra glauca ‘Blue Ridge’ in a container in a sunny courtyard or on a balcony as a low maintenance foliage plant. Reaching around 40 cm in height and forming a clump to around 35 cm over time,’’Blue Ridge’ makes an excellent low maintenance border plant. Once established this is drougb tolerant low care plant. It grows well in full sun and will also tolerate part shade. Although ‘Blue Ridge’ tolerates a range of soil conditions tin will perform best in a well drained soil. Water logged or boggy soils are not suitable. As a feature border, plant ‘Blue Ridge’ at around 35 cm apart. Growth rate is regarded as slow and flowers are a creamy colour. On initial planting water in well with a liquid seaweed fertiliser and then water as the soil dries for the first 3 months. Mulch around the plants to help maintain some moisture and suppress weeds.